Croaghaun is the 712th highest place in Ireland. 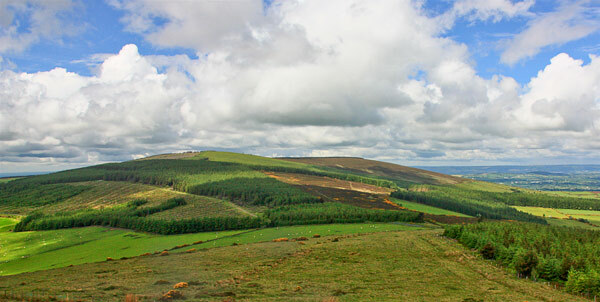 Croaghaun is the most northerly summit in the Blackstairs Mountains area. Picture from group : Croughan from the East. Picture: Croughan from the East. Easy walk with good views of the Blackstairs. As of 2010 the forestry to the south of the summit has been harvested leaving good views of the broad northern end of the Blackstairs. An easy way to start is from the SE at Kilbrannish Forest Recreation Area car park at around S842568 A. Follow a marked track which goes generally NW towards the summit which is around 1 km away. It is also possible to start from the less formal car park at Corrbut Gap S832568 B, walk uphill (north) with the forest edge on your left. Continue in the same direction after crossing a forest track to reach the top.